When Warner Brothers renewed Babylon 5 for its fourth and supposedly penultimate season, they had a problem. B5 was one of a number of shows that had been commissioned as part of an attempt to create a new network out of a number of syndication stations, dubbed PTEN. PTEN collapsed during B5's third season, resulting in some legal and funding problems in getting the show to continue. Whilst its ratings remained decent (outperforming the rival Star Trek shows in some key markets), there was some discussion about if the show's modest success was worth the considerable effort and expense to keep it on the air. Producer J. Michael Straczynski was informed of this debate and decided to take drastic action. To protect the integrity of the series, he decided to collapse several long-running plot threads that had been planned to extend into Season 5 so they ended in Season 4 instead, and pull back on the foreshadowing for Season 5. This way, if Season 4 was the end, the show would have a decent amount of closure whilst simultaneously not making a fifth season an impossibility. Unfortunately, this meant that JMS would have to write all 22 scripts again himself, and also change the nature of how a B5 season works in terms of pacing. Season 4 picks up a few days after thee events at the end of Season 3. Half the Galaxy is at war with the Shadows, but with the Shadow homeworld of Z'ha'dum apparently devastated in a nuclear strike and their ships regrouping, the alliance of worlds brought together by the B5 crew is collapsing as its members withdraw their ships to defend their homeworlds. Sheridan is feared dead amongst the ashes of the Shadow homeworld, Garibaldi is missing, Londo has been summoned to high office on Centauri Prime and the Vorlons seem to be preparing to go on the offensive, and not too concerned about collateral damage along the way. This is B5 at its most serialised. Straight from the off, JMS rams the accelerator pedal right down and the Shadow War is concluded with almost indecent speed, whilst events on Earth and the Minbari homeworld are suddenly back brought into the limelight before the audience can pause for breath. It's certainly a different approach, and whilst the dropping of the irrelevant non-arc filler episodes is laudable, it can be argued that the relentless action comes at some of the expense of characterisation and worldbuilding we saw in earlier seasons. That said, the story itself is gripping, with Jerry Doyle in particular delivering standout work showing how far he's come since the first season, and every character gets their moment in the sun as the crew of B5 finally decisively strike back against the chaos of the last three years. Special mention must go to Worthram Krimmer as the Centauri Emperor Cartagia, one of the most memorable characters to appear in the show, whilst Walter Koenig does some sterling work later in the season. One sad loss between seasons is the dropping of Foundation Imaging as the providers of CGI on the show. The replacement effects are adequate, but are nowhere near the quality of Foundation in terms of imaginative ship design or the use of real-world physics, which is a shame. By the time Season 4 ends, the feeling is that the story is over. The Shadow and Earth Civil War storylines are resolved, if rather messily and not fully, and there is the distinct feeling that there isn't much more to say. As it happened, the show was rescued from cancellation by the TNT Network and a fifth season was commissioned, which proved to be a controversial decision among fans. 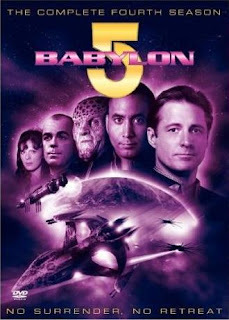 Season 4 of Babylon 5 (****) is fast-moving and provides generally impressive and decent resolutions to a lot of the show's long-running storylines. However, the series has to sacrifice some its pacing and more subtle elements in the rush to cram the story into as few episodes as possible, which leads to some problems. It is available in the UK and USA by itself, or as part of the Complete Babylon 5 box set (UK, USA).